Brazos water snakes are friendly residents of a Texas river. Some folks claim that “the only good snake is a dead snake.” Those may be the same folks who assume that any snake near a body of water is a “water moccasin” that needs to be exterminated. Some confusion is understandable because most nonvenomous water snakes do share some similarities in appearance with cottonmouths, the venomous semiaquatic snakes many call water moccasins. In most parts of our state, however, venomous snakes such as the cottonmouth are vastly outnumbered by harmless water snakes of the genus Nerodia. Two common species in this genus are the diamond-backed water snake and the plain-bellied (or blotched) water snake, found in great numbers in rivers, lakes and ponds across the state. There’s another member of this family of water snakes that’s quite unique. The Brazos water snake (Nerodia harteri) is a threatened species in Texas that occurs in the upper Brazos River and nowhere else. It has one of the most restricted geographic ranges of any North American snake species. Usually 2 to 2½ feet long, the Brazos water snake is light brown with four rows of olive-brown spots on its back. Brazos water snakes can be distinguished from cottonmouths by this pattern and a rounded head and pupils; the cottonmouth has a more triangular head and cat-like pupils. Brazos water snakes are also slenderer than the generally plump cottonmouth. 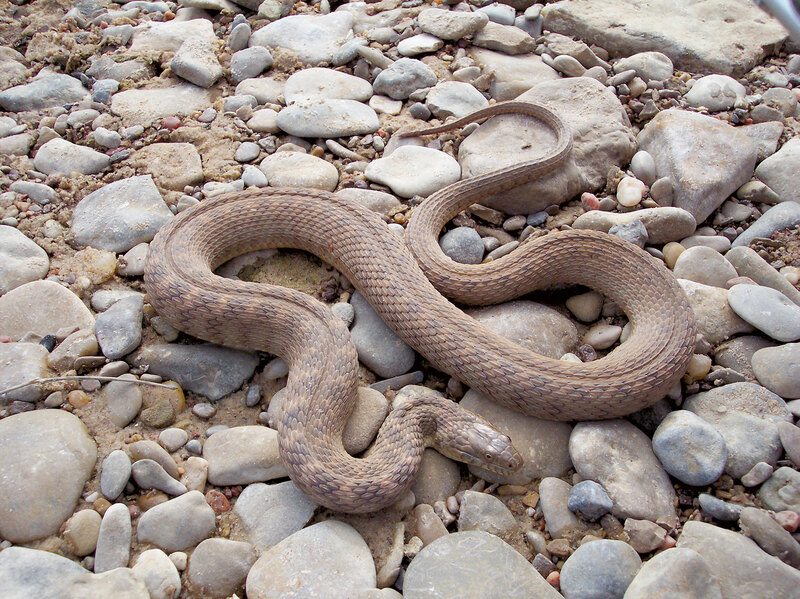 The Brazos water snake is a habitat specialist that prefers the shallow, fast-moving, rocky riffles in the upper parts of the Brazos River. While the other two species of water snakes that share its range are more generalists in their habitat preference, the Brazos water snake is almost always found in these riffle habitats. In fact, this is where it gives birth to live young. The Brazos water snake primarily eats fish that it catches in the river and can sometimes be found basking in the warm afternoon on rocks, logs and plant debris along the river edge. Unfortunately, not a lot is known about the Brazos water snake; it’s difficult to study given its remote location, wary nature and low abundance. The Texas Parks and Wildlife Department is committed to learning more about this fascinating reptile so that someday, through research and conservation, it will be common again along its historic and scenic habitat of the upper Brazos. Maybe as we all learn a little more about the different water snakes of our diverse state, we won’t fall prey to those old anecdotes that give snakes an undeserved bad reputation.